On Sunday I took my friend Kathleen’s advice, and went to Ditch Plains on 82nd between Columbus and Amsterdam in New York City (that “between” makes a huge difference when you and your friend are wandering down Columbus Ave in 19-degree weather). After my unfortunate experience with Sarabeth’s on Wednesday, I was hoping to leave my trip to NYC on a positive note- and fortunately, I did! 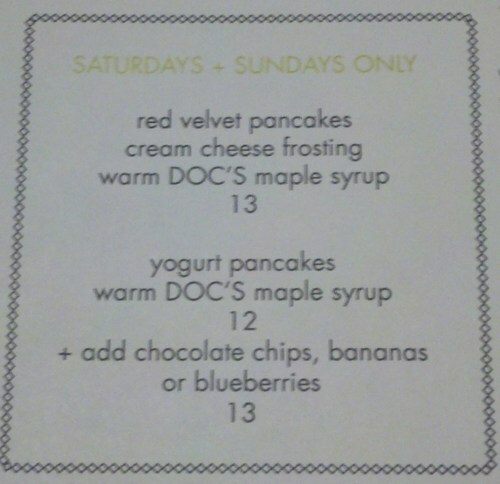 While the menu is somewhat lacking in pancake options, unlike Sarabeth’s these choices are actually enticing. As a fan of red velvet cupcakes, I decided to give the Red Velvet Pancakes a whirl. 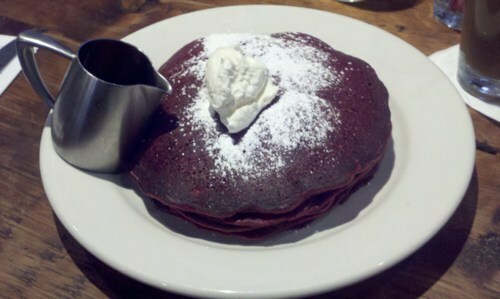 This stack of three red velvet pancakes was actually quite delectable. The powdered sugar combined with the cup-size scoop of the cream cheese topping was the perfect addition to this tasty meal. What I found interesting about this dish from Ditch Plains was the Red Velvet Pancakes actually tasted more like red velvet cake. The reason this notion is not necessarily negative is because you don’t feel sick to your stomach once completing your breakfast. The pancakes taste more like light and airy cake, verses (what can often be) heavy and greasy pancakes. Because of this concept, I was able to finish everything on my plate, leaving only a smile behind.